A note from Wendy: I first heard of Bronwyn via an online friend who told me they knew another South African blogger who lived in California. And then I bumped into her online one day and we both went, "I've heard of you!". 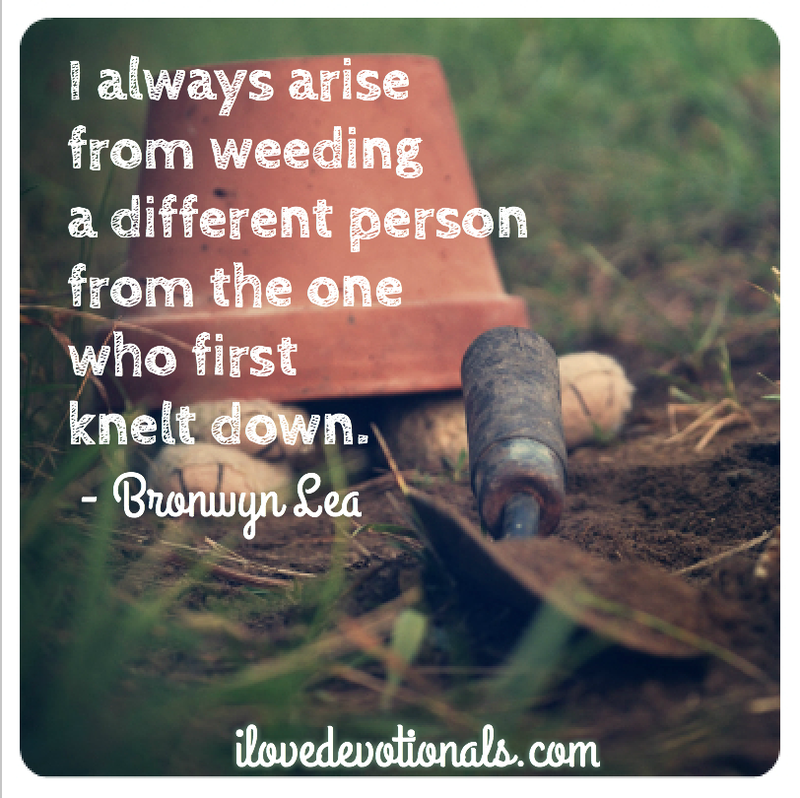 I loved her writing and invited her to share on ilovedevotionals. I sometimes overhear people talk about their love of gardening: how they lose track of time, how they look forward to time alone with their plants, how they fantasize about spending tens of thousands at the local nursery. And yet, every now and then, I find that I can no longer walk to my front door: I have to pick a path through the weeds. And the children can no longer play ball out back, because the grass has grown so long that it absorbs even the biggest bounce. And then, with a sigh, I dig out my crocs and ratty wide-brimmed hat, and head outside with tools in hand to tackle the jungle masquerading as a yard. I loathe yardwork, and yet every time I obey the call to Responsible Home Ownership and set outside to Tend My Piece of Earth, I find a strange magic at work: I grumble for the first half hour, and then find myself falling into a rhythm of easy breathing and deep thinking. For, I cannot trim unwieldy branches without thinking of Jesus talking about the way he prunes us in John 15: not to hurt us, but to bring forth fruit. I cannot plant seeds in our vegetable boxes without remembering the mystery of ministry: how we sow, and others water (even when some are drips! ), and yet it is God who gives growth, and each leaf of faith unfurled in someone’s life is a spiritual miracle. And then there is weeding. Oh, how I hate weeding. But that simple act of tending to my soil tends to my soul in a way that no other practice does. And I cannot pull weeds without getting my hands dirty. And I cannot pull weeds without being forced to think deeply on sin and weeds and how the Master Gardener picked the perfect metaphor for those unwelcome things that grow amidst the good we try to cultivate, and throttle and threaten the fruit. I cannot weed without noticing how deep the roots go: how pernicious and pervasive they are, embedding themselves far deeper than the eye can see, and resisting with every tug of removal. As it turns out, I cannot weed without confessing. “Let us therefore get rid of the sin that so easily entangles,” writes the author of Hebrews. For “if we confess our sins, he is faithful and will forgive us our sins and cleanse us from every wrong” (1 John 1:9). David the Shepherd wrote that the Lord was his Shepherd (Psalm 23). Our God is the Shepherd to shepherds. 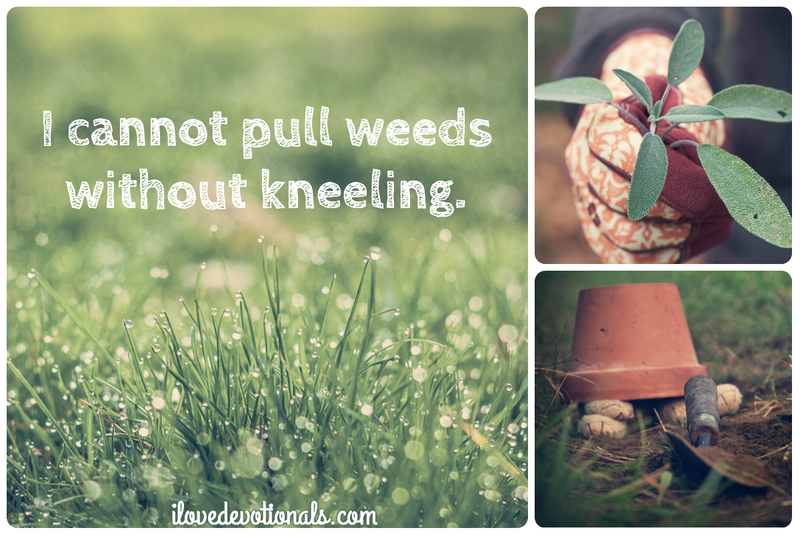 And it only takes a few minutes on my knees with the weeds for me to remember that He is the Gardener to gardeners: pruning, clearing, cleansing, digging, removing that which chokes, and making space for things beautiful. Having done the dirty work, I arise cleaner, humbled, and forgiven. I brush the dirt off my knees and see the good that has come from the hard work of digging deep. And every time, I give thanks. Bronwyn Lea is a South-African born writer-mama, raising 3 littles in Northern California. She writes about things that make her laugh and things that make her think at bronlea.com and at various places around the web. She’s friendly: follow her writing and say hi on Facebook or twitter.